I recently had the opportunity to try out the Tidy Table Tray and Flexi-Diner invented by “mompreneur” Megan Streit-Wilson. 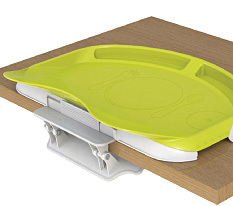 Serving as the first portable tray that clips onto just about any surface, its design promises to keep clothes, floors, and tables clean with a spill catch lip that ergonomically molds to a baby’s body, easily catching spills and falls. I decided to put that claim to the test. My home is a zoo. There are children of all ages running in, out, and around the place constantly. At any given supper, you can find a Mickey Mouse-shaped chicken nugget within a five-foot radius of my dining room table. If there’s an infant over (which is often), forget it- our dog, Piper, gets a hefty serving of puffs, cheerios, and anything else that makes it to the floor. So I welcomed the challenge for a neater eating area. For starters, I was pleasantly surprised that the tray was able to conform to our dining room table. The tabletop width is larger than most, so I was skeptical that this would work at all. The large clip took a solid and firm grasp on the table, so I didn’t have to worry about it getting knocked over in a Spaghettios fiasco. We also happen to like our furniture, so the rubber coating that protected the wood from knicks and scratches was most appreciated. Next test: I invited over Baby Jack, our two-year old neighbor and surrogate child, to join us for dinner with our family. Jack seemed to enjoy the silverware and plate icons indented into the tray, showing him a place for his utensils. In fact, he seemed to concentrate on the tray so much, he was actually a neater eater. This was a far cry from the little boy that usually eats/acts with superhero energy. Ultimately it seemed like he felt special with it, especially when I lifted the Flexi-Diner insert to place in the dishwasher, and he used the Tidy Table Tray to color after dinner. Jack’s older sister Anna, and our 9 year old Maddy, looked on with a little jealousy. My, how the tables have turned. Literally. This product seems to be a winner. Perhaps the best feature about it is that you can experience a little more cohesion at the dinner table. Rather than the distant booster feeding chair next to the table, the little ones can now (neatly!) join us at the same table. With the holidays upon us, this is a great product to bring us all a little closer together, while introducing a little fun. 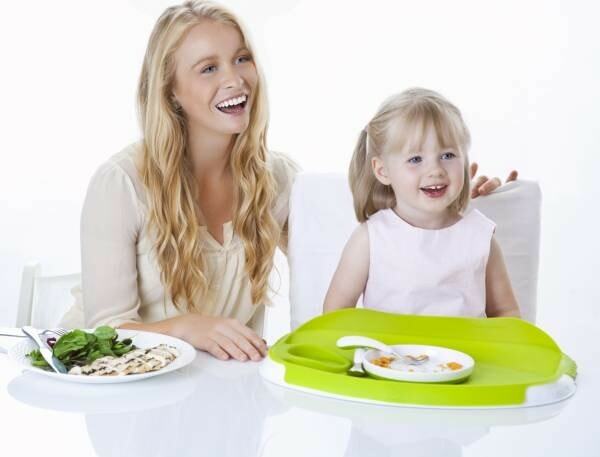 Tidy Table Tray + Flexi-Diner is recommended for infants 18 months and older. It is available for $29.99 at Babies “R” Us nationwide.